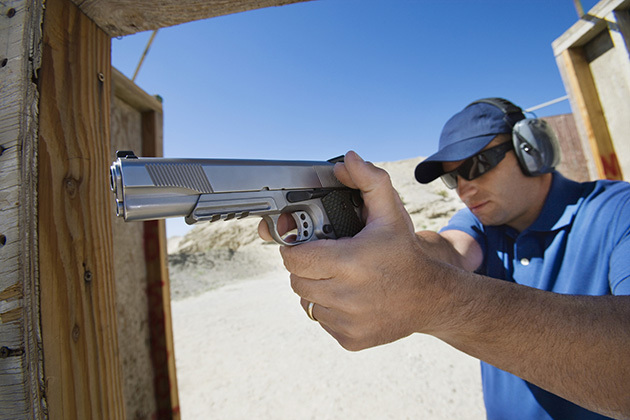 One of the most important things you can learn as a shooter — especially a defensive pistol shooter or long-range precision shooter — is how to press the trigger without disturbing where the sights are pointed. A bad trigger press can cause you to miss man-sized targets at incredibly close distances. When you’re shooting paper in front of friends, this is embarrassing. In a life or death situation, it’s catastrophic. Either way, improving your trigger press is one of the most important things you can do as a shooter. In this article, we’ll go over five quick and easy drills you can do that will give you dramatic and lightning fast gains in performance. There are three main things that will determine whether or not your trigger control will let you hit what you’re aiming at or cause you to throw the shot. 1. The right size gun for your hand and the right weight trigger for your finger strength. You might have great trigger control on a 1911 with a light trigger and horrible trigger control on a heavy double-action revolver. 2. How fast you’re shooting. You might have great trigger control when shooting slowly, but horrible trigger control when shooting fast. 3. Your stress level or cognitive load while you’re shooting. You may have great trigger control in sterile conditions, but less control as the situation gets more complex. Most instructors will tell you that hand strength is important – it definitely is, but it’s only a part of the story. There’s a map of your hand in your brain. The more detailed it is, the easier it is to articulate the end of your trigger finger without moving other joints of your hand. The less detailed it is, the more your other joints are going to move. Magicians, pianists, and fast typers tend to have more detailed motor maps of their hands than loggers and guys who crank wrenches all day. But no matter how detailed your map is right now, we can improve it. Best of all, it’s easier and quicker than most people think. When we improve the map of your hand that’s in your brain, you can press your trigger finger straight back instead of curling it. You can press your trigger finger straight to the rear without your other fingers joining in. You can press your trigger finger straight to the rear without your wrist joining in. And you can do it at high speed and under stress on a variety of triggers. So, here are five high speed tips from performance neurology that will rapidly improve your trigger press (and fix low-left groups). On the surface, this flies in the face of the advice to grip with a 100/100 grip, 50/50 grip or 80/20 grip. But the right grip for you is the firmness of grip that allows you to press the trigger at the speed you need to without disturbing the sights. THAT is your 100 percent. Anything more will cause your other fingers to flex when you’re trying to press the trigger. With one-handed shooting, this means that you’re trading a first shot hit for slower followup shots…but the other drills will help improve this over time. With two-handed shooting, simply increase rearward pressure with your support hand and you’ll shoot more accurately AND you’ll have faster follow-up shots. I go into more detail here but practice rolling coins between your fingers. You can also lay the palm of your hand on a table and try to move each finger individually. Or, lay the back of your hand on a table and try to touch your thumb with each finger without moving your other fingers. Yes…this helps with shooting, but it can also help people who are experiencing pain in their hands and arms. This drill is crazy, but incredibly helpful. With a friend, hold out one hand, palm down. Shut your eyes. Have them quickly touch two of your fingers at the same time at random and try to tell them how many fingers are between the two fingers they touched. They should only touch your fingers for a fraction of a second. Do it five times with your eyes closed. If you didn’t guess 5/5 correctly, try it with your eyes open and then with your eyes closed again. If you did get 5/5, try different parts of the fingers and quicker/lighter touch. One of the crazy things about the brain is that when you improve sensory input from the hands to the brain, you also improve motor output from the brain to the hands. That means that by doing this drill, you may see significant gains in finger control and finger strength. It doesn’t always happen instantly, but don’t be surprised if it does. When you’re stopped at a light in your car, see how firmly you can grip your steering wheel and still move your trigger finger back and forth like you’re pressing a trigger. This will give you a firmer grip, let you run your trigger while gripping firmly, and it will speed up your trigger press. You can also do this when lifting weights, carrying a bag/bucket, using a shovel, etc. I even do it when I’m holding a coffee cup…I’ll hold firm isometric (firm, but non-moving) tension so I don’t crush the cup and run my trigger finger like I’m working a trigger. I go into more detail on this drill here but what you want to do is hold your slide out of battery with Dry Fire Cord. Dry Fire Cord will give you a resetting trigger (even on a 1911) for dry fire practice. You won’t have a "click" when you press the trigger, but you’ll be able to repeatedly press the trigger through it’s entire range of motion without needing to rack the slide. Get a metronome app for your phone and set it at 30 beats per minute (one beat every two seconds). Remove all ammo and distractions from the training area. Aim at a 1" target 6-10 feet away with a safe backstop. Press the trigger every time the metronome beeps without disturbing the sights. Speed up until you find the speed that you can no longer keep your sights aligned with the target throughout your trigger press. Adjust your grip firmer and looser to see what impact it has on your ability to press the trigger without disturbing the sights. Do this drill regularly, and you’ll see dramatic results. In the video, I demonstrate pressing the trigger at a rate of 250 times per minute while shooting a 1" target at 15 feet. It didn’t take a ton of time or money to do this…it just took smart training that exploits how the brain actually works.